Eltham Films. 1969. Director: Tim Burstall. 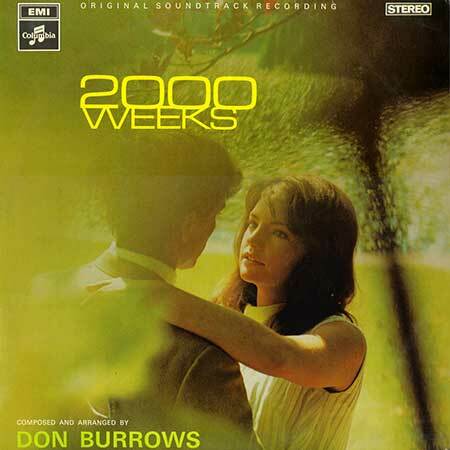 Music: Don Burrows. LP (ST) EMI. SCXO-7883. 1969. Composed and Arranged by Don Burrows. Personnel: Don Burrows: Baritone Sax, Alto Sax, Clarinet, Flute, Alto Flute. Errol Buddle: Alto Sax, Bassoon, Oboe, Clarinet, Flute. Graeme Lyall: Tenor Sax, Clarinet, Flute. Bill Burton: Trumpet, Fluegel Horn. Peter Haslam: Trombone. John Sangster:* Vibes, Percussion. George Golla:* Guitar. Ed Gaston: Bass. Jackie Dougan: Drums. * Courtesy of Festival Records. There’ll Be No Other Time. CD(t) (OP) ABC. 514 297-2. “DON BURROWS - THE FIRST 50 YEARS - 1967-1976 VOLUME TWO”. Tk2 “2,000 Weeks - Opening Titles”. (D. Burrows). 45(a)	(AD)	Columbia. DO-8711. 1969. “2,000 Weeks”. (2:11). (Britten). v: Terry Britten & The Twilights. LP(t) (AD) EMI. EMA 327. 1969. 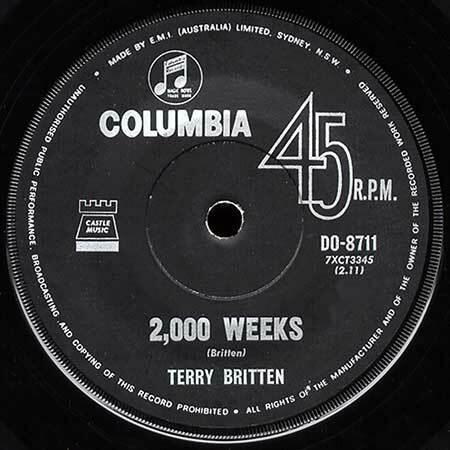 “2000 Weeks”. (Britten). v: Terry Britten & The Twilights. LP(t) (AD) RCA. VRL1-7371. 1980. “SONGS OF THE SOUTHERN CROSS”. S1-Tk4 “2000 Weeks”. (3:30). (Don Burrows, Arr: Julian Lee). (Control). James Galway, Flute. The Sydney Symphony Orchestra Conducted by David Measham.